“Beware of false prophets, who come to you in sheep’s clothing, but inwardly they are ravenous wolves. 16-You will know them by their fruits. Do men gather grapes from thorn bushes or figs from thistles? 19-Every tree that does not bear good fruit is cut down and thrown into the fire 23-And then I will declare to them, ‘I never knew you; depart from Me, you who practice lawlessness!”. Please no offence meant to Lays chips. One thing about all manufactures of snacks is that they have on the package a disclaimer about the volume of their product. 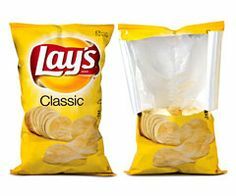 When you open the bags they are half full. How many have noticed this every time they open their product to enjoy eating it? They know the right words to place on their products to entice you to buy them. Long lasting seems to be a stretch these days. So many continue to shrink their items and keep the price the same. I am so glad the Jesus is still honest in all He does! There is never stretching the Truth! He will never mislead you to get you to accept what He is saying! He is not a politician, Thank God! You can always depend on Him to keep His Word! When you get tired of all the half truths in this world, turn to God and hear real Truth that you can live by!